From the latin lucidus; to shine, to see. To make transparent, to make clear to the mind. The following article was written by Sir Garrett (Evil Wordsmith) and posted on the PagansPath.com Message board. 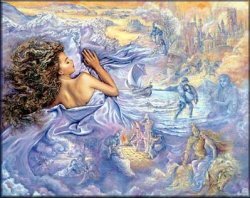 Lucid dreaming is a method of becoming semi-conscious during your dreams. Where you can take conscious control of your dreams and direct them to your desired outcome. This kind of practice is especially helpful for discovering the underlying issues in a night mare; or a recurring dream. Learning how to do this is the tricky part. First of all, it took me years of practice, so if you're planning on doing it tonight, you should make new plans. Second, lucid dreaming is not astral projection. I have been projected twice in my life and I don't like it. "I" may not be the body where I am residing, but "I" do not like doing space walks without the space suit. To start with, you need to remember your dreams. This is pretty easy to do but it still requires practice. With enough practice, you will not only remember your "dreams" but everything that you were thinking during the night. The reason I "quoted" dreams is that what most people think of as dreams are the thoughts that occur during REM sleep. These are the fantastical dreams commonly remembered. The fact that they are unusual and unreal is the reason you can remember them. Non-REM dreams are thoughts that are much more mundane, like "I forgot to get bread at the grocery store." The point here is that you think throughout the night. Get good at remembering your dreams and you'll also remember the thoughts that you don't usually consider dreams. To remember your dreams you will have to write them down. To explain why, I'll have to give you my idea of what dreams actually are. I'll make an analogy to computers here, because I do believe that our "I" is just that, a complex computer. I use computers for business. I can't afford to lose data, so I keep backups religiously. I learned way back in college in 1982 to make backups of everything because it is very hard to retype a 5 page essay from memory 15 minutes before class. (Also learned to touch type that day as well...) The same thing is true of your mind. Sleep is taking the system down for repairs. Have you ever slept wrong on your arm or leg or hand and it hurt all day long? Notice when that happens that there's really nothing that helps with it but another night's sleep. Some repairs can't be made while you're awake. The same thing is true for your mind. The human mind has some great filing mechanisms that we simply don't understand and haven't been able to replicate. An example, if I ask you if you have a phone number for someone, you know almost immediately if you do or not. It doesn't seem to require a look up. I believe dreams, both kinds, handle that filing and indexing. As a result the hardware that is needed for waking periods gets co-opted for use as a filing tool. Everyone has had dreams they thought were real, you were running, using your hands, talking, yet none of it was really happening, unless you sleepwalk. I think the two types of dreams represent different types of filing. When I'm filing, some things, like receipts are easy to handle, cause they are all alike and I already know where I will file them. Other things require some thought to file. I believe NREM dreams do the easy filing and the REM types are for filing out-of-the-box. When you can remember your NREM dreams, you'll see that they never consider things that aren't possible in real life. REM dreams, on the other hand, consider nothing impossible. Now, as to why you must write them down, I'm sure you have had the experience of waking up with a dream fresh in your mind only minutes later to have no recollection of the dream other than the fact that you know you did remember it just after you awoke. I see this as a hardware problem. You remember the dream because it's still in the "buffers" or "swap space". Problem is, that swap space is needed for thinking about things like brushing your teeth and combing your hair. To keep a record of that swap space requires moving it to the space where memories get a permanent record. Writing them down will do this. Most people remember things they have written down. So, you say you generally don't even remember the dream even right after you wake up? NREM dreams are hard to remember because they are unremarkable in terms of thinking. If you see a giant purple flower explode in a fireball of confetti in your front yard, you'll probably remember that for years. However, you're almost never going to even notice that a new violet bloomed yesterday out there, it's unremarkable. So, what we need to do here is concentrate on the remarkable dreams first. This is simply a matter of timing. If you are mentally healthy, and you probably are if you have read all this, you will enter REM sleep every 90 minutes after falling asleep. Want to remember your dreams? Set your alarm clock for a multiple of 90 minutes after you fall asleep. Allow for however long it takes you to actually fall asleep and set your alarm clock to 3 hours after. I've determined from practice it's harder to catch that first REM state, I think it shifts in time more readily than the second or later REM periods. Maybe your mind has to get into the rhythm of sleep before it can get regular. If you do this you will probably catch that REM dream, if you don't, try moving the time forward or back by 5 minutes. When you do catch it, write it down in as much detail as you can immediately. Doing this right away will help you remember the dream. Often, you'll remember more than you thought. With practice you may notice you're also remembering NREM dreams, write those down too. There is another purpose in writing them down. To lucid dream, you are going to have to analyze your dreams. There are several ways to do this. You'll find Spring's approach described in Dream Interpretation. There are a lot of techniques I've used over the years to analyze my dreams. I'd have to say my favorite is word association. Take every noun and verb in your dream and write them in a list. Helps to sit on this for a few days sometimes, or if you have someone you really trust (Did I mention dreams are often full of your own dirty laundry? Be careful who you tell your dreams.) and have them read the list to you randomly. With each word write down the very first thing that comes to your mind, no matter how outlandish it may seem. After you do that construct a new dream by replacing the words in your original dream with the things that you wrote down. In my case this has produced some insight every time I've done it. Once you have become adept at word association and symbolic replacement in your dreams, you're ready for the next step. As you construct your new dream as described above, look for something that you want to use to trigger yourself into being lucid. The easiest thing to me was to use the oddities of the dreams. For instance, in one of my dreams I was flying above the pine trees behind my house. I realized all at once that I cannot fly like this and that this was part of a dream. Realizing this allowed me to explore the dream, instead of watching it played for me, I was now directing it. In one case I allowed myself to crash from a very great height. I guess you don't necessarily die if you dream that you did. Scratch one old myth for me. The point here is that the first thing I used to trigger me was something unreal happening. I think this is the easiest way to do it. Another thing that works is to find something specific in the dream, an image, a person, a thing that you want to explore in a dream. Then when you do have a dream with this thing in it, you can be ready to become lucid. One note here, lucid is not an all or nothing idea. Like most things, it comes in degrees and varies even within the context of a single dream sometimes. Sometimes you will be very lucid, you'll have command of everything in the dream. Sometimes you'll be vaguely aware that you are dreaming, and will continue to watch it unfold for you with little or no control of it. Another thing: You can't do it every night and in every dream. You have to actually sleep and being lucid in a dream is just as restful as being completely awake. Take time to actually sleep. Everyone I know who has successfully become lucid does the same thing the first time: fly. This is fun, try it. I mentioned this already. After you get tired of flying, try crashing. It's really more fun than you imagine. I think it goes a long way toward getting you over any fears you have. I've crashed in many spectacular ways, so apparently it won't kill you. It does wake you up the first few times. Most important, think outside the box. Once, while crashing into the pavement in a dive bomb, it occurred to me while sitting there on the road, there really is no reason to crash just because I dived into a road. So I did it again, only this time, instead of crashing, I went into the road, down into the ground and swam in the rock. If you do the chat thing a lot, you will probably realize eventually that you are actually just talking to yourself. This became so obvious in my case that I had a dream where I was sitting at a poker table in a laboratory with 3 more of me. There was actually a fourth me there, it was the monster we had created who was locked in a freezer. During this dream I changed my point of view to each of the various copies of me, including the monster. This brings up the possibilities with nightmares. I used to have a lot of nightmares when I first started analyzing my dreams, probably because I was going out of my way to remember my dreams. Now if your nightmare is very scary it is easy to use that as a trigger. The problem is staying lucid. Like crashing, having your monster, or whatever is bad in your dream, get at you tends to wake you up. Keep practicing this, eventually you can get to a point where nothing your monsters can do will scare you anymore. You will be lucid, and will have complete command of your dream. This means you will naturally instantly destroy any monster you encounter with ease. Once you start doing that, it's time to do something harder, again, you'll get scared and it will tend to wake you up, or kick you out of lucidity. This hard part: Hug your monster. Give it love and attention, just like you would a child throwing a tantrum. If you're analyzing your dreams, you will probably notice that two dreams can be widely different and yet be essentially the same dream. When you start to consistently love your monsters, they will change. Mine went from being unknown enemies firing at me from a distance to powerful creatures like dragons and mobsters who were more in my face. Once I could easily hug them, they changed, moved to being something slimy and hard to hug. Don't let them get away though, keep working on them. I am the butterfly dreaming that I'm human. Judging by the giant talking fly swatter over there, it's going to be a nightmare. Once you have learned to control your dreams through becoming lucid; you can use your control to learn about the underlying issues or messages of your dreams. Talking with the things in your dreams is a good way to do this. "Why are you here? ", "What is this supposed to represent to me?" are just a few questions you can ask and receive clarity for. When the dream is a nightmare; gain control of the monster; give it love and conquer it's influence over you. But again, talk to it and ask what it's here to show you or teach you about yourself. Just be open to the answers, even if you don't like what they are. Don't over analyze these messages, just write them down and come back to them when you have a clearer head. Don't be over judgmental of yourself either. Just take some time to think about your lucid conversations and how they might apply to your current life; or a current situation you're experiencing. The biggest part of all this is to keep a journal so you can compare your lucid dreams to each other. Often times they will build on each other and provide insight from one to the next.